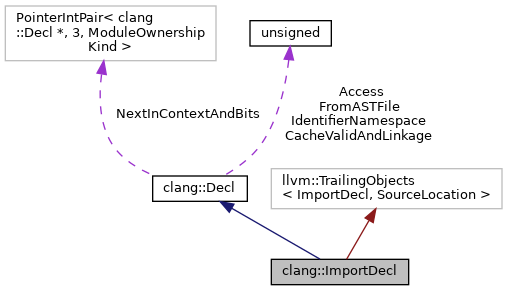 Describes a module import declaration, which makes the contents of the named module visible in the current translation unit. Import declarations can also be implicitly generated from #include/#import directives. Definition at line 4155 of file Decl.h. Definition at line 4210 of file Decl.h. Definition at line 4211 of file Decl.h. Create a new module import declaration. Definition at line 4679 of file Decl.cpp. Create a new, deserialized module import declaration. Definition at line 4697 of file Decl.cpp. Create a new module import declaration for an implicitly-generated import. Definition at line 4687 of file Decl.cpp. Referenced by clang::Sema::BuildModuleInclude(), and clang::Sema::createImplicitModuleImportForErrorRecovery(). Retrieves the locations of each of the identifiers that make up the complete module name in the import declaration. This will return an empty array if the locations of the individual identifiers aren't available. Definition at line 4703 of file Decl.cpp. Referenced by clang::index::IndexingContext::importedModule(), and clang::ASTDeclWriter::VisitImportDecl(). Retrieve the module that was imported by the import declaration. Definition at line 4199 of file Decl.h. Referenced by clang::CodeGen::CGDebugInfo::EmitImportDecl(), clang::index::IndexingContext::importedModule(), clang::ASTDeclWriter::VisitImportDecl(), and clang::TextNodeDumper::VisitImportDecl(). Definition at line 4712 of file Decl.cpp. Definition at line 4157 of file Decl.h. Definition at line 4158 of file Decl.h. Definition at line 4159 of file Decl.h.